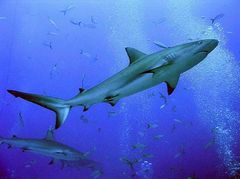 Popular Science Blog - Immaculate Conception, or Fishy Hook-Up In the Shark Tank? The second shark-reproduction mystery in as many months (read about the May virgin shark birth here) has surfaced at a U.S. aquarium—this time, at the Virginia Aquarium and Marine Science Center. According to an Associated Press report, the aquarium’s veterinarian Bob George observed that there might have been "hanky-panky” in the shark tank. During an autopsy of a deceased female blacktip reef shark named Tidbit, George found a 10-inch-long shark pup poised for birth. But with no male blacktips listed on the aquarium’s roster, George was clueless as to the baby-daddy's identity. DNA samples of both Tidbit and her fetus were sent to one of the co-authors of last month's purported parthenogenesis occurrence in Omaha, NE. Researchers hope to learn whether the pup was a rare hybrid of two similar species (an event never before seen in captive sharks), or another instance of asexual reproduction. That's a very interesting story. I hadn't head about the first one. I suppose it's good to know that the husbandry in the aquarium is solid enough to encourage breeding, but I don't know if hybrid sharks are a good idea.